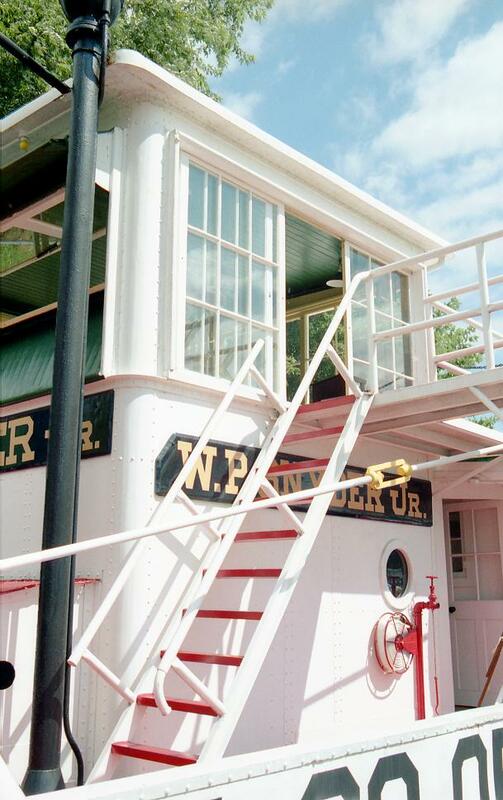 Lepi Enterprises were hired by the Ohio Historical Society to reconstruct the paddle wheel on the W. P. SNYDER, Jr. a sternwheel, steam driven, towboat that was originally built as the Carnegie Steel Company towboat W. H. Clingerman in 1918 by Rees & Sons Company of Pittsburgh, Pennsylvania. In 1938, she was renamed J. L. Perry, and in 1945 A-1. In August 1945, she was sold to Crucible Steel Company of Pittsburgh, and renamed the W. P. SNYDER, Jr. in September 1945. 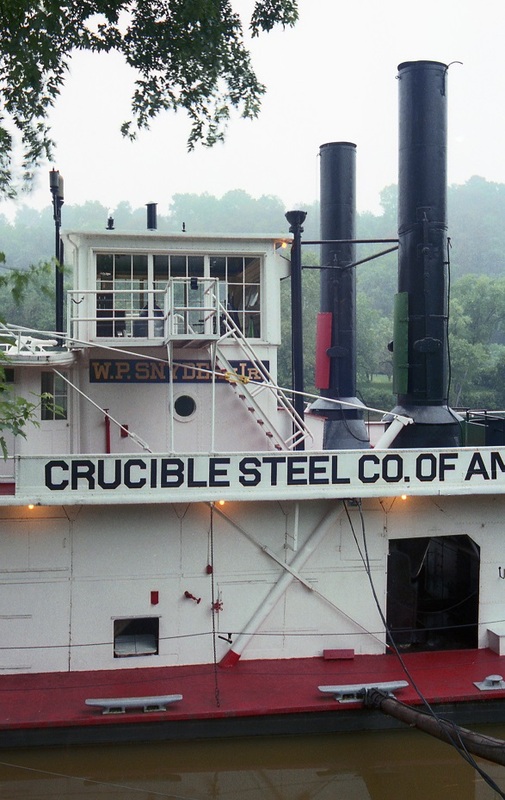 She was a sister vessel of W. H. Colvin, Jr., and she towed coal on the Monongahela River until being laid up on 23 September 1953, at Crucible, Pennsylvania. In the summer of 1955, the boat was given to the Ohio Historical Society for exhibit at the Ohio River Museum in Marietta, Ohio. 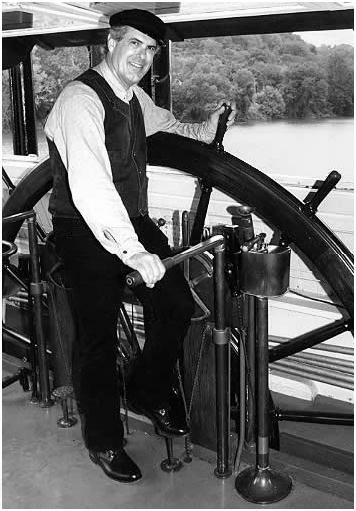 W. P. Snyder, Jr. was the last steamboat locking through Lock 1, on the Muskingum River, before that lock was removed. She arrived in Marietta, Ohio, with Captain Fred Way Jr. as master on 16 September 1955. As one of the first steel hull towboats constructed, she was fitted with the prominent anti-hogging struts and cables necessary on wooden hulled stern wheelers. At the time it wasn't known if they would be needed with the steel hull construction. 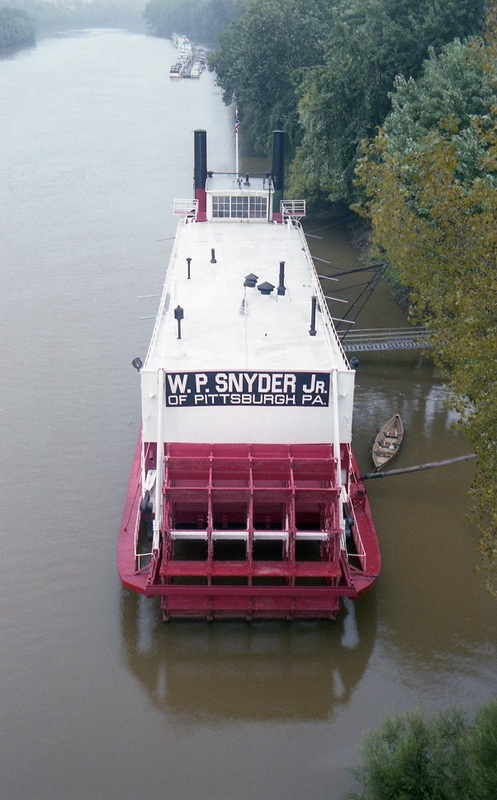 W. P. SNYDER, Jr. has been permanently moored on the Muskingum River in Marietta, Ohio, at the Ohio River Museum. Visitors to the museum receive a guided tour. 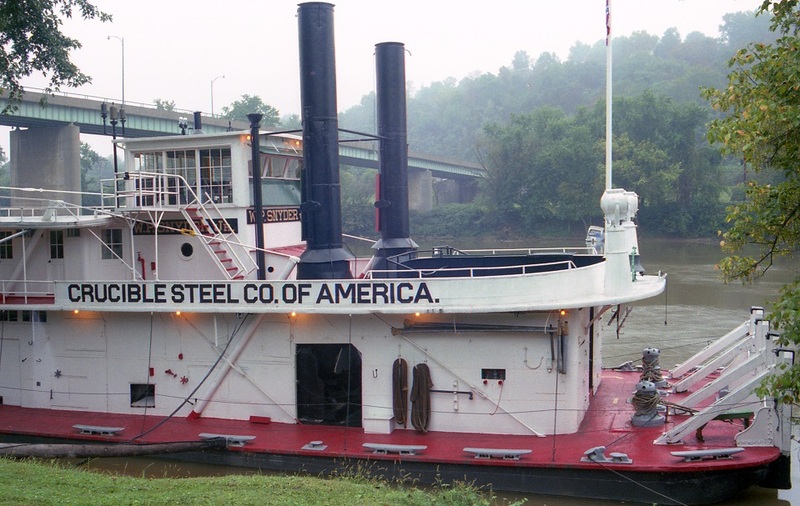 She was "the only intact, steam-driven sternwheel towboat still on the nation's river system", but "was in danger of sinking". 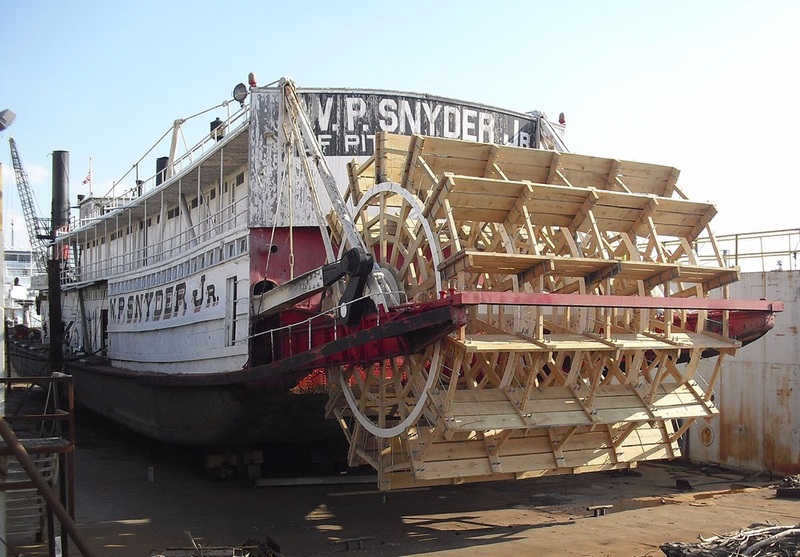 On 21 November 2009, the SNYDER was towed from Marietta to South Point, Ohio to have her hull replaced. She was towed back home beginning on 15 September 2010 and arrived back in the Muskingum River at Marietta on 17 September. 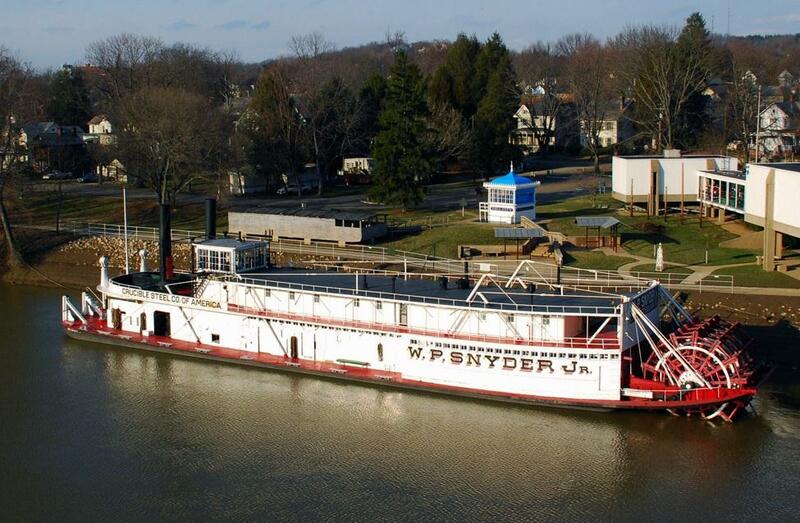 THE W.P.SNYDER JR. ON THE MUSKINGUM RIVER AT MARIETTA, OHIO FOR OUR PAGE OF IMAGES. 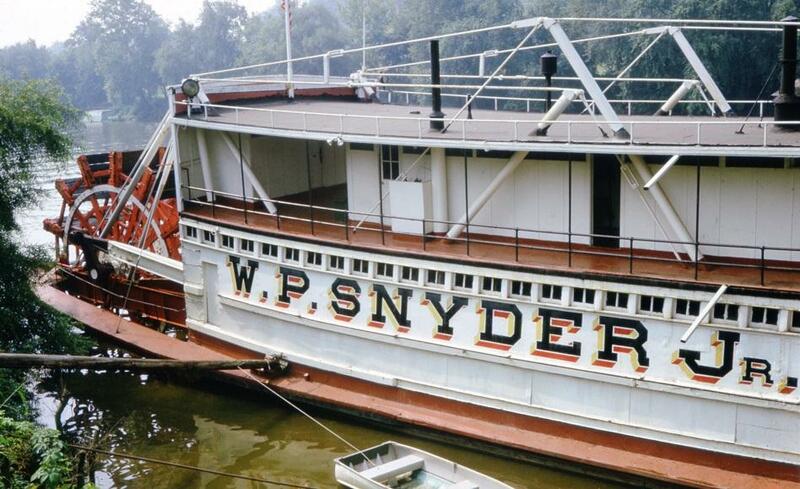 THE HIGH ANGLE 35MM COLOR SLIDE WAS TAKEN BY AN UNKNOWN PHOTOGRAPHER IN 1973 WITH SNYDER'S NAME PAINTED BOLDLY ON STARBOARD STERN FORWARD OF THE STERNWHEEL. THE MUCH HIGHER FULL LENGTH DISTANT VIEW OF THE PORTSIDE PROFILE WAS TAKEN BY BRUCE REA. THE PARK LIKE GROUNDS OF THE OHIO RIVER MUSEUM COMPLEX CAN BE SEEN ON SHORE AND INCLUDES THE PILOT HOUSE OF THE STEAMBOAT "TELL CITY" OUTDOORS WITH ITS BRIGHT BLUE ROOF EASILY SEEN FROM THIS DISTANCE. That's the Muskingum River out the window. This classic towboat is moored along the shore adjacent to the Ohio River Museum complex which includes the restored pilot house of the steamboat TELL CITY on the lawn nearby the SNYDER. The two historic photos from Murphy (above) are characteristic of the W.P. SNYDER, J.R. when she was still running. 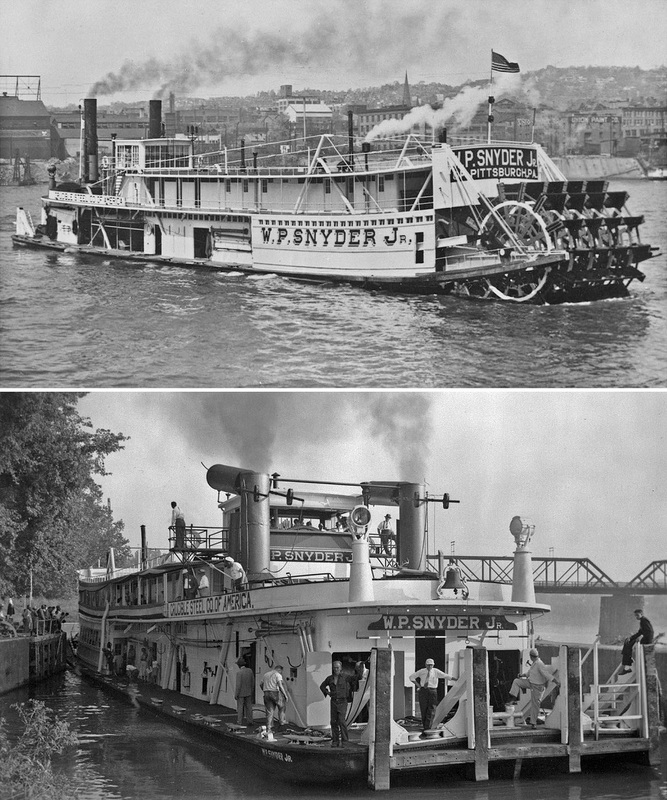 The bottom photo must date from after the SNYDER JR retired in the mid-50s, judging from the number of volunteer friends on board. Scanned from negatives of the towboat W.P. 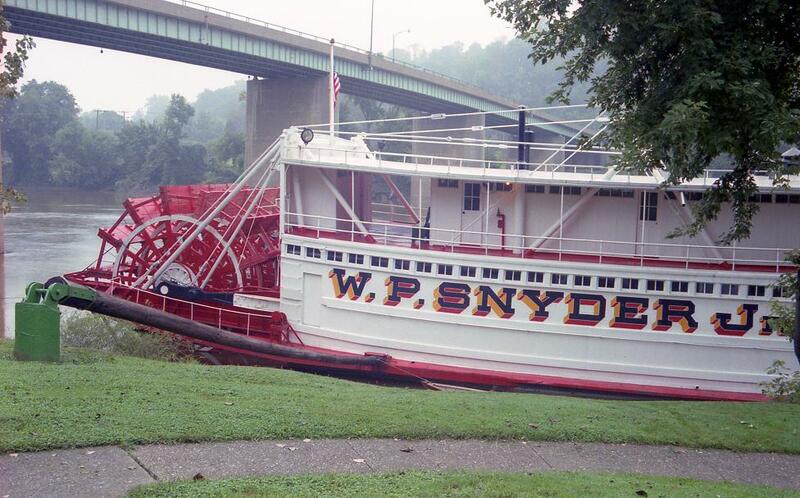 SNYDER JR. which I photographed at Marietta, Ohio on the Muskingum River in Sept 1990. Got up early that morning at the Lafayette Hotel, had breakfast with Fred Way and company downstairs before heading to the "Campus Martius" Ohio River Museum which was not yet open. The SNYDER JR is moored there and the museum's park like grounds were open and I was also able to get photos there and the high elevation photos from the Washington Street Bridge just south of the boat. The overcast morning light softened the shadows and there's an atmosphere of tranquility on the Muskingum and the film grain on these photos was very subdued for a change, am very pleased with these images..
During that trip I drove up the Muskingum to Zanesville (where Zane Grey the Western novelist grew up) which is 70 miles northwest of Marietta. The Snyder Jr. was in fine shape 24 years ago when I was there but the wear and tear of floating on the river and enduring the elements made it imperative that the boat get some restoration and miraculously she was given a grant for a million dollars to get her hull put into A-1 shape and to have her painted and otherwise spiffed up. She was towed back to Marietta this Spring and this month she was towed to Louisville to be an attraction at the 100th birthday party for the Belle of Louisville (which started off as the Idlewild, then became the Avalon before finally being bought and restored by the city of Louisville where she's a beautiful excursion boat which I have taken two evening cruises that were wonderful). From 1918 to 1954, the towboat W.P. 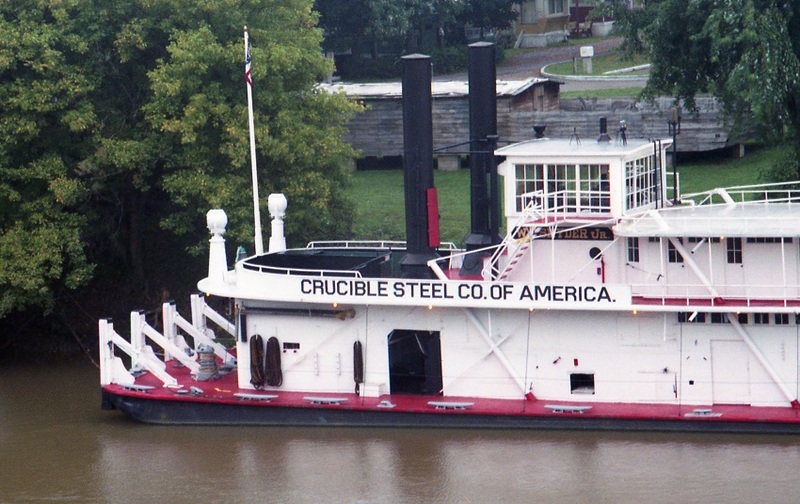 SNYDER JR. (in the class of towboat referred to as a "pool boat") pushed barges of coal for Crucible Steel (and other previous owners) in the Pittsburgh area. 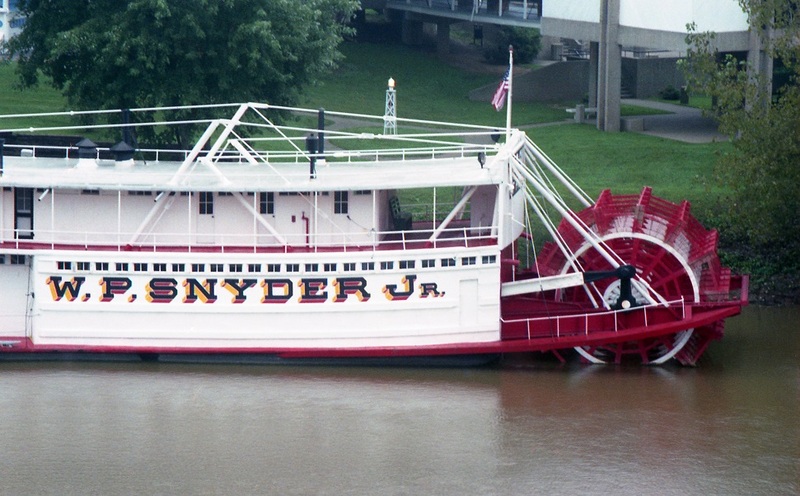 In 1955 the Snyder Jr. was donated to the Ohio Historical Society to be moored at the Ohio River Museum. On September 16, 1955 the SNYDER JR arrived at Marietta under her own power, smoke billowing from the stacks and the steam whistle echoing through the valley. I took this from the deck of the Valley Gem, as we passed by on the river.